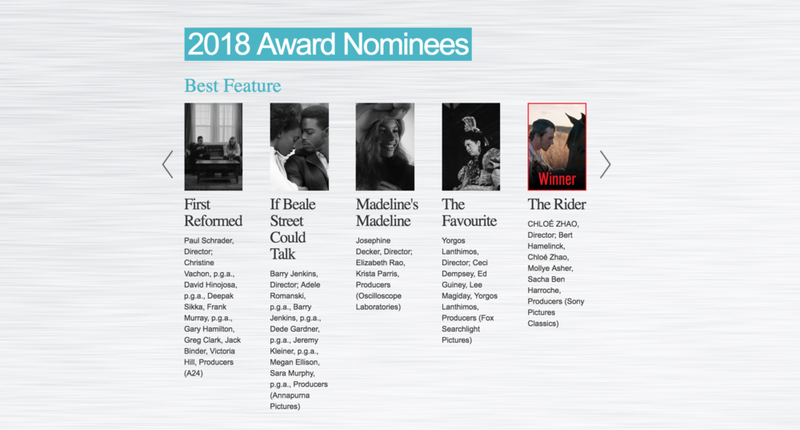 "The Rider" Wins Best Picture at the 2018 Gotham Awards! I am extremely grateful and humbled to have received a Best Editor nomination from this year's Independent Spirit Awards. "The Rider" is a film that I love with all of my heart, and I am so happy for audiences to see the film soon! In addition, the film is also nominated for Best Picture, Best Director and Best Cinematography. Congrats to the entire Rider team on all of the nominations! "THE RIDER" WINS TOP PRIZE AT CANNES DIRECTORS' FORTNIGHT! I am thrilled to announce that "The Rider" has won the top prize at Cannes Directors' Fortnight. I love this film with all my heart and am thrilled for the entire team! The film will be distributed by Sony Pictures Classics. Here is a link to one of the reviews of the film. "THE RIDER" TO PREMIERE IN CANNES DIRECTORS' FORTNIGHT! I am beyond thrilled to announce that, "The Rider", a film that I had the pleasure of editing, will have its world premiere in Directors' Fortnight this year in Cannes. It is such an honor to be part of a festival that has showcased the work of so many legendary artists. "BAD BATCH" TRAILER IS RELEASED!!! Click below to check out this awesome trailer for BAD BATCH. The film hits theaters June 23rd! "THE BAD BATCH" TO PREMIERE AT THE 2016 VENICE FILM FESTIVAL! I'm so happy to announce that Ana Lily Amirpour's THE BAD BATCH will have its world premiere at this years Venice Film Festival! The film will be premiering in competition. Click HERE to see the full list of films in this years competition.